We're packing up our stuff this morning at the Farmington fairgrounds and getting ready to turn toward Southeast Arizona. It's looking a lot like fall around here, time to get south to some warmer country. 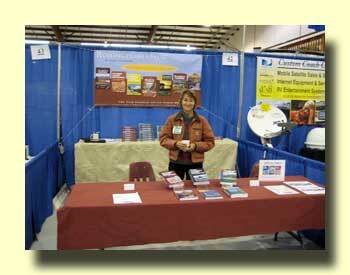 From October 13 through October 16 we have been attending the FMCA Rocky Mountain Ramble . This has been an amazingly well run rally and it has been well attended with about 500 rigs. We manned our Rollinghomes Publishing booth and presented five RVing seminars: Mexico, Baja Peninsula, Alaska, Southwest US, and Pacifici Northwest. We've not attended an FMCA rally for quite a few years but after this one we're definitely planning on others. These people are ENTHUSIASTIC! We've had the time to do quite a bit of hiking this summer in southern Utah and the Four Corners region. We would like to recommend a hiking guide that we have found invaluable. It's Hiking the Southwest's Canyon Country by Sandra Hinchman.